Welcome back to “Pike on the Fly”, in part one I went over rods, reels, and lines we use to chase the “water wolf”, part two will focus towards leaders, the tools, and flies to use. Once you’ve put together your rod outfit the next item to think about is your leader. There are two ways for one to go about finding a leader. First and the easiest way would be to buy a tapered leader specified for pike. Rio, Scientific Anglers, and Umpqua all have pike specific leaders, they look like your traditional tapered leader you would use for trout but have a section of steel or titanium wire tied to the end to keep the fish from slicing your fly off. This is a great way to get started, simple and fast, just a loop to loop connection, tied your fly on the end and you’re ready to go. Using wire isn’t always the best way to go; If there’s a lot of underwater vegetation wire leaders can become kinked up and can hurt you presentation, on top of that sometimes pike can become leader shy, depending on the fishing pressure and water quality, wire leaders can spook them. For locations or times when wire is not ideal we switch over to custom hand tied leaders. I know what some of you are going to think when I say “hand tied leaders”, sounds complicated but it’s not. 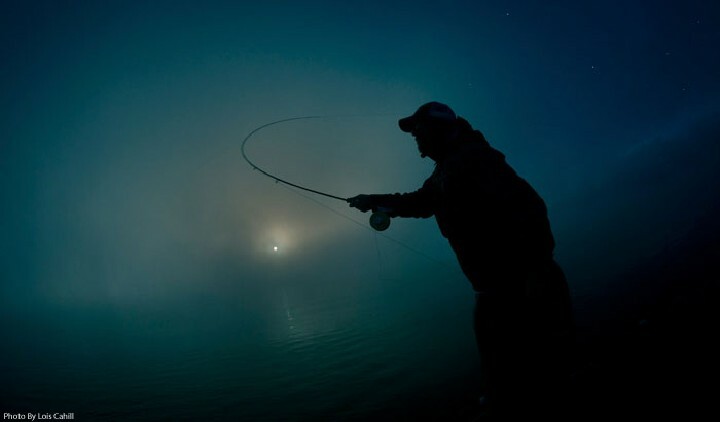 I’ll start with about a 3 foot section of 20 pound nylon tippet; then tie a 50lb micro-barrel swivel onto one end of the 20 pound using a clinch knot, then about a 3 foot section of fifty – eighty pound fluorocarbon onto the other side of the swivel, again using a clinch knot, for a bite guard. On the end of this bite guard I’ll tie on a heavy-duty clip to reduce the amount of bite guard tippet I’ll go through during the season. Next on the agenda would be a good selection of flies, you’ll want to have multiple colors and sizes for varying conditions. I still stick to the old saying when it comes to my fly selection, “light colors on light days and dark colors on dark days” but like most of fly fishing it’s always great to research the local fishery to find out what other species are located in there and start building you selection from there. On top of “matching the hatch” other components I really look for in a pike fly is: flash and water pushing ability, doesn’t necessarily have to be both but at least one of those attributes is a must for myself. The flash does a great job enticing the fish and coercing a strike, where the flies mass helps push water towards a target’s lateral lines, once again enticing and coercing a fish to eat. 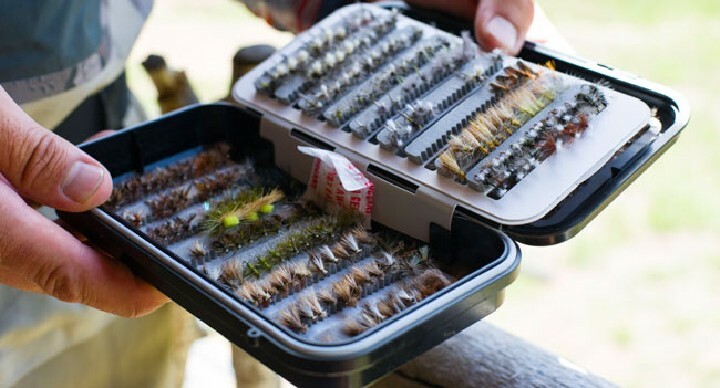 A few of my favorite flies to use in our area are the Gen-X Bunny, Umpqua Pike Fly, and Barry’s Pike Fly, and assorted bucktail patterns in various colors and sizes. Although these are my go-to I have also had luck with a few saltwater baitfish patterns, such as EP minnows, clousers and deceivers. You will need some essential tools when out chasing pike. The first and foremost are a pair of pliers, the longer the better in this case. You want to keep your hands as far away from the business end of the pike as you can, the shortest pair of pliers I would use would be 8 inches. If the fish gets hooked down deep you will have to cut the fly off, that’s why I use a long pair of pliers, in the 12 inch range, if my fly goes any deeper than that I will just cut the leader in order to avoid unnecessary stress and damage to the fish, don’t worry if you have to use this technique, the fly should come out naturally soon after. Next item would be a large net or pike cradle, both have their benefits but I have found if you are fishing by yourself a net is the better way to go, typically you need an extra person to hold the cradle while you steer the fish into it. The cradle makes for a quick and easy release with as little stress on the fish as possible. You are able to work on removing the hook while the fish rest in the cradle, allowing it to remain in the water and not adding pressure to the swim bladder. When fishing by yourself I’ve found a net to be more beneficial, it’s easier to carry and to secure your catch with the limited number of hands you’ve got. With the net, I very rarely pick the fish up and out of the water, instead I’ll get in into the net bag and let it rest in the water while I remove the hook, this keeps the fish in a more natural position without putting unnecessary pressure on the spine or vital organs. Once the fly is free, I’ll take a few quick pictures and let it go so it can grow. You always should have a place to store the equipment, day pack works best when hiking the beaches, it fits all the necessary gear for a full day and most packs offer a few compression straps to attach large items to. The Simms Waypoints Large Day Pack is a solid choice to carry a large net comfortably thanks to the framed design and large enough to fit your fly boxes, tools and your lunch. This day pack features a sling pocket design which is great when you’re wading around a lake and need to grab something out of your bag quickly, being able to swing the bag around your body instead of completely removing it helps when standing in the middle of a lake. The weight distribution of the Waypoints Day Pack is the best I have ever experienced, once again, thanks to the framed design and the separate back support to promote airflow to keep your core cool. Buff – These are lifesavers when it comes to blocking out unwanted weather. Great for both winter and summer fishing, blocks UV rays, protects against wind, keeps you warm in the winter and cool in the summer, and quick drying. Lippa 4 Life – I like having these for the smaller fish, allows you to grab the fish by the mouth with minimal stress and damage done to the fish. They also allow for a solid grip on the fish mouth when removing the hook out of any toothy critter. Stripping Guard – Hours upon hours of casting and stripping can cause havoc on your fingers, having a few of these helps avoid the cuts and burns one can get from consistent rubbing of the line against your finger. Camera – To take a picture of anything of note throughout the day, hopefully something fishy. 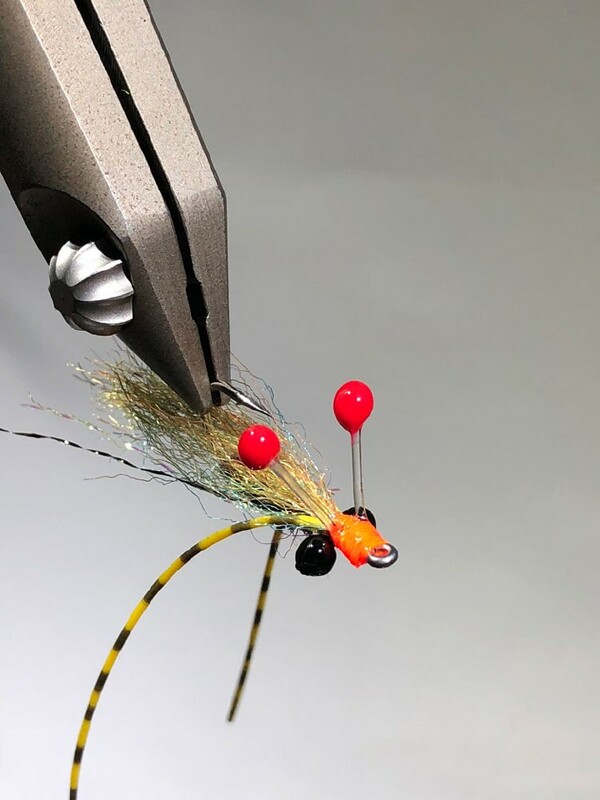 Big Nippa – I have used my trout nippers to cut the tippet for my pike leaders and it works the first couple of times, dulls the blades quickly, and getting the pliers out every time you need them is a pain. The new Big Nippa from Rising is killer for cutting your big game and saltwater leaders and tippets. 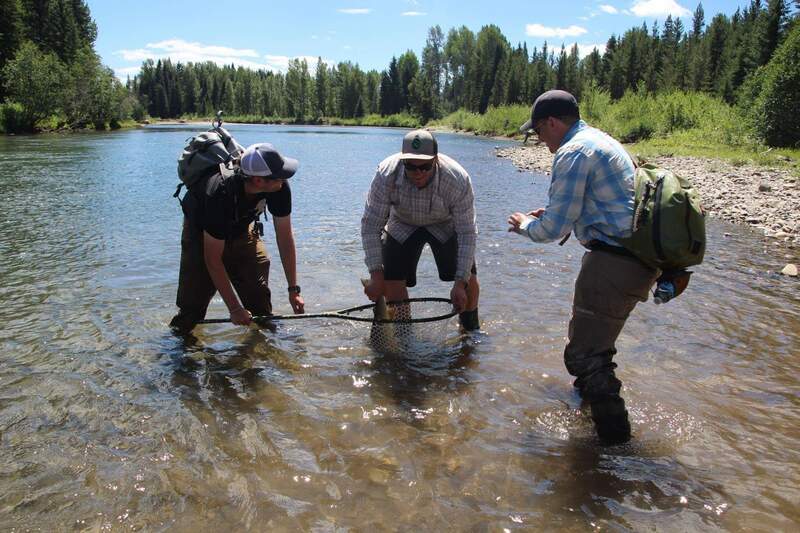 Orvis Stripping Basket – When wading around the lake a stripping basket comes in handy to keep your line from tangling around vegetation and to reduce drag from the water to increase casting distance. Flexible Measuring Tape – For bragging rights. Thanks for reading “Pike on the Fly”, hopefully it has given you some insight on the gear we’re using here in Utah to catch Esox Lucius. If you have any questions about gear, techniques, or where to go (in Utah) feel free to give us a call at 801.617.1225 or swing by the shop!